Hydraulic Server Windows are an easy way to create a large open space without removing an entire wall. These windows are perfect for residential and commercial applications where you need a large area to open easily and beautifully. At Euroclad Windows and Doors we’re happy to offer many different solutions to our clients so they can choose the one that’s right for them. We love that we can add yet another option for you to consider with hydraulic server windows. What is a Hydraulic Server Window? The hydraulic server window offers you a truly simple system that will automatically open the window. Although the windows can be designed in several different ways, they’re usually built to be large enough to create an opening that you can literally serve guests through. Our server windows are built with a metal clad frame that will last a long time with very little maintenance. The windows are not only easy to take care of, but also beautifully built and can fit into almost any style of home. We are able to build these windows sashes with every wood type, so we really can match the look you’re going for. One major benefit of being a custom door and window manufacturer is that most of the time we can give you exactly what you’re looking for! Is a Hydraulic Server Window Right for You? Most of the time the answer is yes! 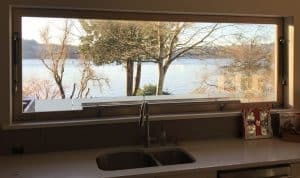 If you’re looking for a large window that can open automatically into a space for serving or simply creating a large indoor-outdoor space without installing a door, a hydraulic server window is the best choice. However, larger windows do require the proper structure to be put in place. If you’re building a new home this is almost never an issue as we can make sure the plans include the proper requirements. If you’re installing into an existing home or business, you may need a little extra work behind the scenes to make sure everything is safe and works as expected. The best way to know if it’s right for you is to speak with our team to find out exactly what your needs are, and if there are any alternatives that are a better fit. 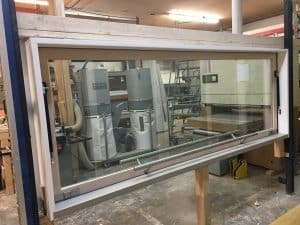 What are the Alternatives to a Hydraulic Server Window? As mentioned at the start, the Hydraulic server window is just one of several options that we have available. Depending on your budget, style, and structure there may be a different option that we recommend. Glass wall systems may be a better fit if you want to create a completely open indoor-outdoor area, or there’s always the option or a large window that works on a track system that allows you to open the window almost all the way. Even a traditional window may work for you if your goal is just to create a large viewing area, but without needing the window area to open the full width. To find out what options will work best for you, drop by our showroom and speak with our team to go over the possibilities for your home or business. Every building and situation is unique, and we have many unique solutions that will work for you!